This recipe comes from Pat Whelan’s book, An Irish Butcher Shop and has been quoted by Katy McGuinness in the Tribune Magazine as being great value for money, working out at less than €7.00 per portion. Cooking marinated meat for 6 hours may seem excessive, but the melt-in-the- mouth shredded meat that results makes it all worth while. Remove the lamb from the fridge and wipe it with a paper towel. Combine all the other ingredients to make a paste and rub it over the lamb. Cover and refrigerate for at least 3 hours but preferably overnight. 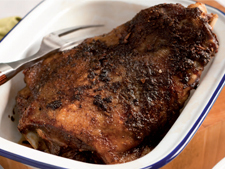 Put the lamb in a roasting pan, add 1 cup of water and cover with aluminium foil. Place in the oven and cook for 3 hours. Reduce the temperature to 120°C/250°F/gas mark 1 and cook for a further 3 hours. When cooked, let the meat stand for at least 10 minutes. Shred the meat with a fork.